If you’ve been putting off that reupholstering project here’s a little incentive to get started. Adafruit now has some electroluminescent wire which is perfect for use as piping. They’ve outfitted a small sofa with the glowing material and we think it looks great whether switched on or not. The installation process is really quite easy. The EL wire is covered with clear material that provides a continuous tab running the length of the wire. This can be stapled on like you see in the image above, or sewn into a fabric seam. 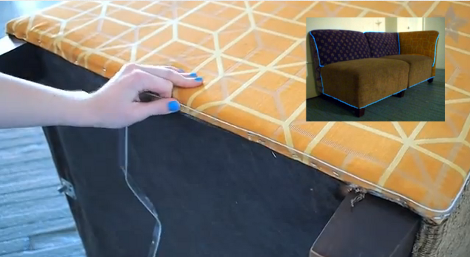 So you could take an existing sofa cover, remove all the stitching, and sew it back together with the EL wire replacing the original piping. The video after the break shows how simple the process is. This will be a nice complement to that Daft Punk table we’ve been meaning to build. P.S. I love to see a woman solder. and looks like she is pro at it too. Love the blue finger nail polish! I kept dreaming of a couch I thought I’d never see, and then, one day, I laid down. Am I not a 1337 h4xx0r since I do not know what “EL” means? El Hackaday is slowly transitioning to Spanish. It’s real fun when the plastic cover eventually breaks! Nothing like sitting down on a stun gun! would this ever become a fire hazard? Totally doing this to my car.